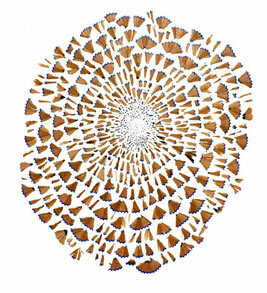 Sam Winston’s pencil shavings image is visual poetry. I’m not sure if it’s an actual pencil drawing (which would be mad crazy) or if it’s a photograph (or scan) of pencil shavings. The title is, “Pencil Drawing”. Either way, it’s a nice piece. I did a similar piece with gator clips about 7 years ago. I arranged gator clips on a photocopier in a circular fashion and wham bam there it was. I love photocopier art. I’ll try to dig up the piece.